Both from a strategic and moral standpoint, it is no surprise that when military action is contemplated, governments tend to favor effective tactics involving the least risk to human lives. Even better are effective tactics involving low risk to all human lives. If the goal of the military action is justified, what could be morally problematic with using such means? These widely held notions likely motivated the U.S. Navy’s recent contemplated use of military dolphins in the ongoing conflict between Iran and United States. As reported in the New York Times, Iran has threatened to block the Strait of Hormuz, a crucially strategic waterway where 16 million barrels of oil flow through every day, and it can do so in relatively short time by deploying mines. U.S. governmental officials warned that Iran’s threat, if carried out, would cross a “red line” provoking a military response. Should the situation escalate to that point, the U.S. military would need to deal with the problem of how to detect (and then destroy) the mines, for which there is a time tested solution: mine-detecting dolphins. Once detected, the job of destroying the mines falls to human divers. Nonetheless, even though military dolphins operate only in a secondary role, the risk of harm to them is very real; they could accidentally set off live mines and, more seriously, prompt the Iranians to intentionally target them and other dolphins in the area. Still, is there a moral problem here? In addition to the strategic merits of the tactic, wouldn’t the very low risk to humans fully justify using dolphins in this way? Underlying the idea in favor of such use is the notion that humans possess greater moral standing than dolphins—that is, in comparison to dolphins, the welfare and interests of humans count more when making moral decisions. On one version of this view, humans possess greater moral standing in virtue of belonging to a certain species, and thus are free to use non-humans as tools because their interests can be ignored. This is speciesism at its most blatant, which, as philosopher Peter Singer explains, is “a form of prejudice against beings who are not ‘us’ that is akin to racism and sexism.” Similar interests in different entities ought to matter equally, regardless of differences in intelligence, abilities, race, or gender. Extending this principle of equal consideration to animals, conscripting dolphins into military service, Singer argues, fails to take their interests seriously. In particular, it fails to take seriously the notion that getting blown to bits is just as bad for them as it would be for us. However, a sophisticated defender of military dolphins is unlikely to think that humans are free to use them in whatever way we like, or that dolphins possess no moral standing at all. Speciesism, like racism, can have subtle forms. Perhaps a sophisticated defender would maintain that while dolphins have less moral standing than humans, they are still creatures worthy of moral consideration, not merely tools for human use. Such a defender may point out that animals in the Navy’s Marine Mammal Program are provided with the “highest quality of humane care and treatment” in state-of-the-art facilities, “mixed with genuine compassion” (although this claim has been disputed here). 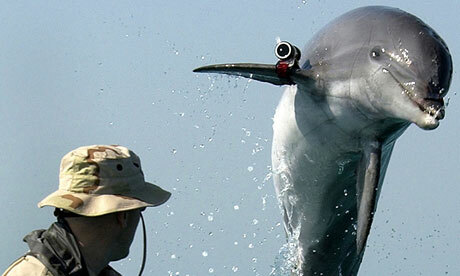 Nevertheless, human interests and goals can justify using military dolphins in some circumstances where they would face a significant risk of harm. On this view, humans presumably possess greater moral standing in virtue of being persons—something dolphins are not. 6) have a variety of higher order intellectual skills (including abilities to learn, to communicate, to solve complex problems, and to engage in abstract thought). More of the enlightened ones, for lack of a better descriptor, need to be brave and pronounce these statement publicly. More of us need to openly fight the religious fanatics who believe that only humans are in possessions of souls, if there even is such a thing as a soul. Perhaps, in today’s world , the world “soul,” to those who know better, is just a poetic device. The enlightened ones need to re-educate those who believe that soul, or lack thereof, is an excuse to abuse animals and to prefer human life over other species. Spencer, excellent post on an issue I didn’t even know about. Thanks! As I’ve noted before, “speciesism” is an invented, rhetorical and essentially meaningless term and concept. Briefly, it’s an ultimately futile attempt by a certain ideology to avoid even engaging in a meaningful debate, and therefore trumpet claim to the moral high ground, by casting any different or opposing views in with racism, sexism or other forms of bigotry. Which, of course, is sheer posturing and wishful thinking. Racism and sexism violate real, objective standards of equality — whereas the “equality” violated by speciesism is an imaginary construct. I’ll put the life and safety of a man or woman in uniform before the welfare of a dolphin any day of the week, and not lose a second of sleep over it. All that said, the larger, and real, issue is the long-standing and increasingly important need for humanity to simply mature past having military conflicts anyway. This topic is new to me, and you’ve done a superb job summarizing it, Spencer. I listened to Professor White’s entire 55-minute talk (under your “elsewhere” link) and found it fascinating. I hope I get around to reading his In Defense of Dolphins book. HAL, your last sentence (except for the words “larger, and real,”) resonates with me. I notice that Tolstoy didn’t write the inverse, “As long as there are battlefields, there will be slaughterhouses.” As a moral philosopher, he knew that the lack of empathy that causes humans to demean and destroy the least powerful among us translates into an aggressive, warlike, oneupsmanship mentality against fellow humans — and in that exact order. merely for the sake of his appetite. And to act so is immoral. [T]here are ideas of the future, of which some are already approaching realization and are obliging people to change their way of life and to struggle against the former ways: such ideas in our world as those of freeing the laborers, of giving equality to women, of ceasing to use flesh-food, and so on. As long as there are slaughterhouses, there will be battlefields. A vegetarian diet is the acid test of humanitarianism. If a man’s aspirations toward a righteous life are serious, … if he earnestly seeks a righteous life, his first act of abstinence is from animal food, because…it is plainly immoral, as it requires an act contrary to moral feeling, i.e. killing—and is called forth only by greed. … [Vegetarianism] serves as a criterion by which we know that the pursuit of moral perfection on the part of man is genuine and sincere. Pity is always the same feeling; it doesn’t matter whether you feel it for a human being or a fly. Or, I would add, a dolphin. While I wouldn’t be as strident in my opinions as Tolstoy, I do think that vegetarianism is noble moral pursuit. As a hunter and omnivore myself, I’ve never had any real quarrel with vegetarians, at least they practice what they preach — so to speak. I think that mass meat consumption is unsustainable. It’s not good for the environment, the conditions under which such massive numbers of livestock must be raised make cruelty practically unavoidable. I don’t think the problem is in killing and consuming meat, per se. I can say with complete comfort and confidence that hunting has increased my empathy for animals and respect for life. And I think one would find that common among ethical hunters who are doing it for the right reasons — in other words, primarily to put food on the family table. No, I think the problem lies with the production of animals as mass commodity, and the bulk of consumers being urban dwellers — far removed from the lives — and deaths — of the animals they eat. I’ve often said, if everybody who eats meat had to participate — or at least watch first hand — the killing and butchering of an animal — there would be far more vegetarians. Whether mass meat consumption and a distance from nature, wildlife or pastoral farm life lends itself toward the perpetuation of war, I cannot say. War is a complex thing. But I do think it boils largely down to patriarchy. As I like to sometimes surmise, the reasons — or rationalized justifications — for war are usually about power, money, territory or natural resources. But the primary cause of war is testosterone poisoning. Not that testosterone, masculinity and men are intrinsically bad (after all, I are one, for heaven’s sake… LOL) — but when the balance of power and social standards and structure are tipped strongly toward the masculine side, the results are predictable whenever conflicts or disagreements might arise. All that musing aside — as I said, I don’t think mass meat consumption is sustainable. Vegetarianism is likely the wave of the future, for both moral and purely pragmatic reasons. I agree with the general principle that this article aims to set, which is that animals similar to dolphins should be treated with respect; however, I do not agree with your approach. You accurately concede in your conclusion that the traditional conception of personhood is flawed; this is an understatement! Based on this standalone criteria, people with special conditions, (e.g. physical & mental ailments) that have absent senses of awareness, no sense of self, unable to control their actions, and the rest, are not persons. Without a more sound and well thought out criteria for being a person, it’s hard to take this article seriously. Overall, this was an entertaining read, and I do respect your attempt at bringing out this potential issue; nonetheless, this article falls apart at it’s conclusion. The central point of your argument rests on a dilapidated construction! You state that the scientific evidence offers powerful support for your conclusion, but you do not flesh out any of those supporting points; you merely offer a link that you expect your audience to accept as true. Although speciesism may be indefensible, everything that is not speciesism is not defensible (e.g., the traditional conception of personhood). My apologies for being crude, but this load of internet residue should have been shot into the internet nanny condom and never published. Net nanny…please come home to this child! Apologies to Spencer Lo and the dolphins for this post being off-topic and long-winded! This is directed to any reader who knows in his heart that “respecting” and killing a fellow being are mutually exclusive and to any reader who might be ready to concede as much. I’m rereading a book that includes a chapter on hunters and anglers who have laid down their guns, bows and rods. One of the first-person narratives is by Ken Damro, author of A Northwoodsman’s Guide to Everyday Compassion. After his mild-tempered beagle Mollie got caught in a trap and bit him when he was extricating her, he started to think twice about what he was doing to animals (he had done some trapping in his youth). In his gradual moral awakening, Damro reached the point where he felt badly being associated with hunters and fishers. Still, he discovered it wasn’t easy giving up his “addiction” to killing, which held him in a vise. He realized that he had been fooled by the “unfounded line of reasoning” that hunters need to manage the deer population. But even that realization didn’t cause him to lay down his gun. What did it for him, though, was when, despite his best attempt at a clean shot, he wounded a doe at day’s end and it was too dark to track her. The next morning, as he followed her trail of blood, he was haunted by the image of her spending the night in pain. Damro was also a livestock farmer, a business he retired from at the same time he left off killing free-living animals. “I remember about the time I was going through this personal journey, a serial killer by the name of Jeffrey Dahmer from Milwaukee, Wisconsin, was apprehended. In an interview with Dahmer, he explained that among the reasons for killing his victims, was that of love and control. I remember him saying something to the effect that he loved them and didn’t want them to leave him so he killed them; and in killing them, he was in control. “I thought then, as I do today, that most hunters, fisher people and trappers kill innocent animals out of love and control. This is a possessive love — an immature love — a Jeffery Dahmer kind of love. “In defense of these consumptive activities, as well as in defense of livestock farming, folks often tell me that if every effort is made to ‘use’ all the parts of the killed animal, then this somehow justifies the action. And again, when I hear this I think of Mr. Dahmer, who also made such an attempt to use his victim’s body parts for food, in the creation of furniture, a spiritual shrine, etc. Dahmer also admitted that eating his victims gave him special attributes–those of his victims. I have been around the hunting and fishing communities long enough to know that many of these ‘outdoorsmen’ believe in similar myths, i.e. eating strong animals will make you strong. “I know drawing parallels between serial killers and hunters, fishers, and trappers can sound harsh to those who draw definite lines between humans and the rest of the animal kingdom. However, as time goes on, and as humanity continues its long awakening from the dark, ages, it will become apparent that purposely killing sentient life of any species is a crime. And when this golden age of awakening arrives, then, too, humanity will enjoy life without wars, starvationm, widespread illness, and the lion’s share of societal madness and unjustness that we experience today.